The month of November holds a few “get it done” type events that regularly show up on my Twitter feed. Two of the more prominent events that I see among those I follow are NaNoWriMo and NaGaDeMon. I’ve mentioned my intention to participate in the past, but I never have. National Novel Writing Month (NaNoWriMo) challenges the participants to write a 50,000 novel in just 30 days. Starting on November 1st and running until the 30th, participants are encouraged to share with each other in the NaNoWriMo forums and help encourage their peers to finish what they start. Good or bad doesn’t matter… only finishing something. Currently, there are over 280,000 participants this year. WOW. National Game Design Month (NaGaDeMon) is a similar event with the goal of designing a game in the month of November. What is defined as “finished” is left to your interpretation, but the intention is that you design a game and play it in the 30 days that the event runs. Last year, NaGaDeMon attracted a few hundred participants and it’s growing each year. I started to participate last year, but the game I began working is still a work in process… so I never really committed. This year, I’m all in and Dead Woods is going to be my design. 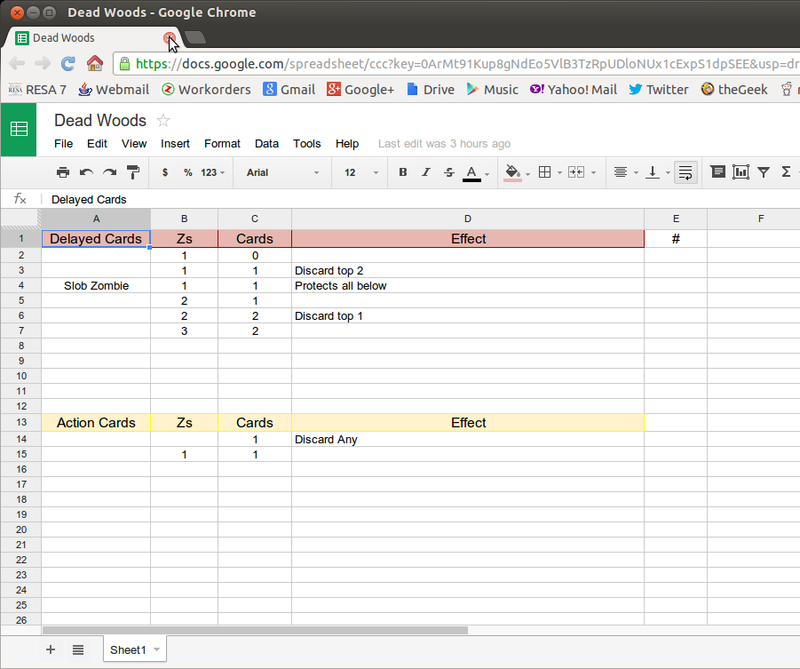 Dead Woods will be a quick-playing, 2 player, zombie themed, card game. I’ve been thinking about this idea for a while now (maybe that’s cheating?) and it fits this challenge perfectly. There is nothing complex about this game, and I have no intention of making it complex. The game will consist of a deck of cards, and maybe some sort of play mat… but I could use cards for that also. The theme is familiar, so the graphic design won’t be particularly challenging. I should be able to handle all the art myself. As I said above, there is a bit of personal interpretation to what you consider a “finished” game for NaGaDeMon, but for me, finished means finished. Done. Art and all… and that’s exactly what I intend to do. Remember, this project isn’t for the market. This project is for me. It is a very personal project. You see… I live with this girl. Her name is Jayme. She happens to be the mother of my children, and my best friend. I love spending time with her. We used to play games together frequently, but we are both ultra-competitive and it wasn’t “fun” for us. I miss playing games with her. I mean… she is seriously in love with all things zombie. We watch The Walking Dead together. She’s read the comics. She watches zombie movies whenever she can. She has zombie tee shirts… zombie themed tote bags… if she came home tonight with a zombie tattoo, I wouldn’t be surprised. So, as I did with Princess Dice and my children, I decided it was time to start thinking about a game for Jayme and I. It needs to play great with just two, and it needs to have a cool theme for her… which is obviously zombies. I design games. Lots of games. It’s one of the few things in life I consider myself to be good at… and it’s time for me to put that skill to use… for us. Dead Woods is loosely based on an old 2 player design I worked on about 10 years ago called Borderlands. That game worked, but wasn’t particularly interesting enough to keep playing. 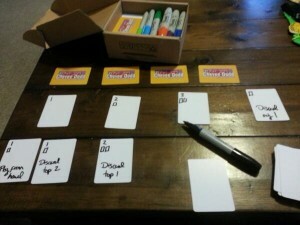 I came up with a better resource management system that encourages bluffing and I’m adapting it to similar game-play as the old system. In this game, the players are controlling the zombies which are trying to get at the humans camping in four cabins. This is achieved by playing zombie cards from your hand, on the cabins… but playing cards is delayed a turn. You place them face down (and can bluff if you want!) and on your next turn, flip them over. The tricky part is knowing when to stop. There is no static drawing mechanism in the game. Instead, when you play cards, it grants your opponent the ability to draw cards! Every time you play, you are enhancing your position as well as possibly making your opponent stronger. The game continues until one player overwhelms two of the four cabins. That player wins. You overwhelm a cabin by having X more zombies there than your opponent. In the original game, it was five but that’s likely to change for this version. There’s more to the game than just that, obviously. There are cards that let you kill zombies or move them around. There are cards that let you protect your zombies. There are cards that let you steal from your opponent. There are cards that let you do a bit of hand and deck manipulation. There is a game here. It’s not just a dead-simple, Knizia-inspired, numbers design. It has a bit of meat to it… but it’s nothing I can’t accomplish in a month. I hope. 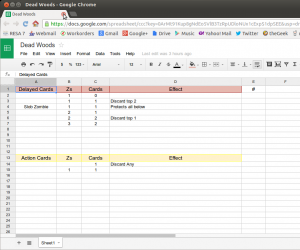 After sketching out the cards last night, I took to Google Docs to start spreadsheeting everything. This is very abnormal for me, but given the time constraints on the project, I can prototype faster digitally and be working on the final layout and graphic design at the same time. This should help me crunch this out quickly and hopefully, with a dedicated tester at home, I can iterate through the design process quickly and transition to the end-goal faster. So, here’s to being productive this #NaGaDeMon!